Buy the Guava Lotus Travel Crib and Portable Baby Playard. It is amazing for travel! It folds up really compactly into a bag that is wearable as a backpack. It is extremely easy to set up and break down -- I was able to figure it out without reading any instructions. 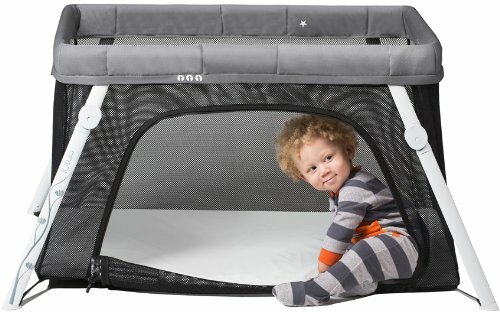 One of the mesh sides has a "zip up side door" -- this allows you to slide the baby in and out and will totally save your back when it is time to lift the baby out of the crib. The crib has tabs that fit through the slits at the edges of the sheets making the mattress stay secure. The Fun Shade (sold separately) keeps light out, which is really convenient if your baby is accustomed to blackout shades and you are staying in a bright room. I also found it convenient because I was sharing a room with my baby, so the shade obscured his view of me when I needed to be in the room and kept me from distracting him from sleep. The only negative that I can think of is that you need to buy their sheets. But if you buy click through this link to buy, you get a free sheet. My runner up choice was the BabyBjorn Travel Crib. A few of my friends have this crib and love it. The backpack and zip up side door features tilted the scales for me in favor of the Guava Lotus Travel Crib and Portable Baby Playard. I used mine a ton on my trip. I wore the baby on the plane, on walks on the beach, etc. See my post on carriers and what to carry when wearing your baby. I can think of many reasons that you might want one. Mine came in handy most for protecting the baby from the sun while I wore him. I own both Aiden & Anais and Organic Bambinoland swaddles and prefer the latter. Heading into the airport, swaddle in hand. Dress Baby in an Overnight Diaper for the Plane, Car Ride, etc. My husband did this inadvertently in the early morning haze, but it's actually a great idea. Of course, you should change your baby when you can but you don't want to end up with a leaky diaper when the fasten seat belt light is on. He also put S's shirt on backward and I left it that way all day. I have two silicone leashes they can both be used for toys and sippy cups and are both dishwasher safe. I think they are both great to have for everyday life with a baby, but especially useful on the road. I generally prefer the L'il Sidekick Leash. You are meant to loop the end with the star around your stroller bar, carrier, etc. and the other end around a toy. I do use it that way almost every day. For the plane ride, I looped a toy around each end (the Baby Einstein Take Along Tunes and a Hape Mini Maraca). It just made things more manageable -- the toys were less likely to fall or be thrown on the floor and I was able to reach into my bag and find the toys more easily with them attached to the leash. When I wore S in the carrier I attached a toy or sippy cup to the carrier with the leash. The Brili leash is designed specifically for cups. If you are using softer or tapered cups like the Take n Toss cups, the Brilli may work better than the L'il Sidekick Leash. I brought along the Baby Einstein Take Along Tunes and a Hape Mini Maraca, mainly because they are small, can be attached to a leash, and I know that they keep my son entertained for a while. As a new toy, I brought along the Jellycat Fishy Tails Soft Book. My son had never seen it before and loved the bright colors, crinkly pages and how all the different colored and textured tails felt in his hands and mouth. I love that it entertained him for 20+ minutes at a time and is washable. Baby Einstein Take Along Tunes and a Hape Mini Maraca attached to L'il Sidekick Leash. 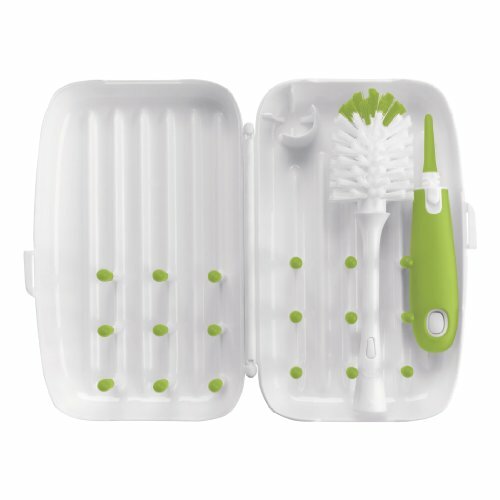 This will come in handy whether you are staying at a hotel, or with family or friends. This is only necessary if your baby is really young or if you are going somewhere that the water isn't safe for drinking. 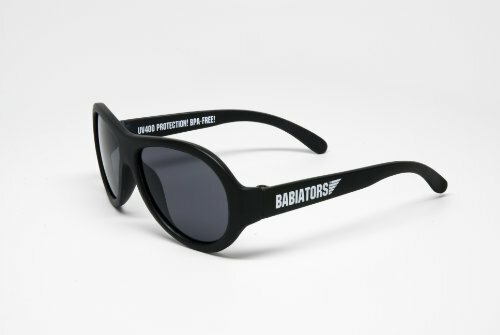 Babiators are really well made and comfortable for baby. Plus, if you register your sunglasses the company will replace them once if you lose or break them. S modeling his brand new Babiators (no, I couldn't wait for daybreak or to remove the sticker). 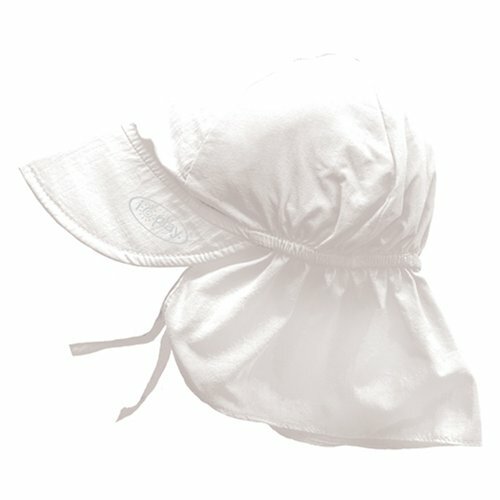 iPlay makes exceptionally practical sun protection gear. My son is willing to wear this one, it is thin, covers his neck and shades his face and provides UPF 50. There are cuter hats out there, but - especially since it takes up almost no room in the diaper bag - this is a good one to keep handy.